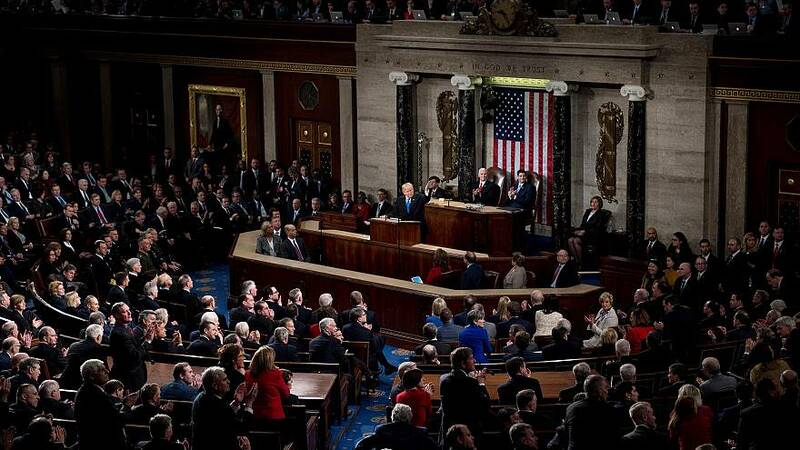 For live coverage and analysis of the State of the Union address, tune into euronews.com in the early hours of Wednesday morning. Live blog available from 0230 CET. Address from 0300 CET. WASHINGTON — Halfway through his term, and with Democrats clambering into the nomination fight for the right to try to oust him in 2020, President Donald Trump will address Congress and the nation in his annual State of the Union address Tuesday. It's a chance for Trump to set his agenda for the year and beyond — to frame the story of his presidency so far as he gears up for another campaign. He'll do that at a moment that seems to call for some presidential spin. Trump is coming off a five-week partial government shutdown that he once promised he would be "proud" to force, in what turned out to be an ill-fated attempt to gain leverage over congressional Democrats in his quest to build a wall on the U.S. border with Mexico. Despite continued economic growth, his approval ratings have cratered in recent weeks, dropping under 40 percent in many surveys. With all of that as a backdrop, he will, for the first time, address a joint session of Congress in which one of the two chambers — the House — is under the control of rival Democrats. His relations with them, already strained, deteriorated during the shutdown to the point that Speaker Nancy Pelosi, D-Calif., forced him to delay the State of the Union until after shuttered federal agencies had reopened. The administration has promised Trump will deliver paeans to bipartisanship — but there are also signs he plans to throw some roundhouses. Here are at least five questions likely to be answered when Trump steps up to the House rostrum Tuesday night. Bipartisan — or just partisan? Last week, an administration official previewing the president's speech for reporters said that Trump would call on Republicans and Democrats in Congress to work with him in bipartisan fashion to accomplish joint goals for the country. The only excerpt released from his speech: "Together we can break decades of political stalemate. We can bridge old divisions, heal old wounds, build new coalitions, forge new solutions, and unlock the extraordinary promise of America's future. The decision is ours to make." Two days later, Trump's campaign sent out an e-mail to his supporters that ripped Democrats. "Ever since our incredible movement began, the Democrats have been against us. And over the past few weeks, they have taken their obstruction and radicalism to a whole new UN-AMERICAN level," the email, under Trump's name, read. "First, they REFUSED to put the safety of Americans at our Southern Border above their own political interests, and then they disinvited me from speaking at the PEOPLE'S State of the Union on the original date." Trump will talk about a host of issues on which there is some common ground between the parties, including certain enhancements for border security, transportation spending and lowering drug prices. But it would be a surprising twist if he didn't take some shots at the Democratic side of the room. Endless war, or ending wars? Most Republicans and many Democrats in the Senate have voted against a "precipitous withdrawal" from either country, but the Democratic presidential candidates found themselves siding with Trump — even if they disapproved of his methods and perceived motives — on the basic premise of winding down the U.S. presence on both fronts. "We've been there for 19 years, almost, we are fighting very well," he said of the Afghanistan war in an interview with CBS that aired over the weekend. "We're fighting harder than ever before. And I think that they will — I think they're tired and, I think everybody's tired. We got to get out of these endless wars and bring our folks back home." A new plan on immigration? Trump's efforts to rewrite immigration laws have fallen apart in Congress. He hasn't gotten any money for the wall he promised to build. He hasn't been able to get new laws to crack down on illegal immigration. And he hasn't been able to redesign legal immigration programs to limit the number of migrants and the criteria for allowing them into the country. The biggest stumbling block has been the wall, which Trump has insisted on and has been unable to secure the funding for, even when his own party controlled both houses of Congress. An administration official hinted Friday that Trump may lay out his vision for a deal. "The president is definitely going to talk about immigration," the official said. "He's going to talk about where we are on that debate. And he's going to try to present the path forward." Mary Kate Cary, a speechwriter for President George H.W. Bush, said that because Trump talks to the public so often already through his Twitter account and frequent off-the-cuff remarks, he could use the State of the Union in a different way — "to speak directly to the Democratic congressional leadership who will be in the room about a deal on border security and DACA," the Obama-era program providing deportation protection for immigrants brought to the U.S. illegally as children. So how will Democrats react — and how many will show? On Monday, a handful of Democrats announced that they wouldn't attend the speech. For those who are in the chamber — especially the set who are running for president — eyes in the press gallery above the House chamber and watching at home will be trained on their reactions to key phrases in Trump's speech. They'll be asked why they chose to stand, applaud, stay seated or roll their eyes at particular moments. And in the spirit of Rep. Joe Wilson, R-S.C.'s infamous "You lie!" outburst during President Barack Obama's address to a joint session of Congress, there's always a chance that someone on the Democratic side will decide to voice an opinion in the midst of the speech. Keep an early eye on the rabble-rousers in the freshman class for clues as to how Trump will be received. After he's done, Stacey Abrams, who lost a tight race for Georgia's governorship last year, will deliver the Democrats' official response to the State of the Union. Sen. Bernie Sanders, the Vermont independent who is weighing a second bid for the Democratic presidential nomination, is set to give his own reply to Trump. Traditionally, the president invites a series of guests whose presence is designed to underscore points he will make in his speech. Typically, he will pause during his remarks to recognize them and their stories. Trump's guest list, which was released by the White House Monday night, includes family members of a Reno, Nev., couple whom prosecutors say were murdered by an undocumented immigrant; felons who were released through a presidential pardon and the recent criminal-rehabilitation law Trump signed; a Homeland Security Department agent who works on human-trafficking cases; and survivors of last year's synagogue shooting in Pittsburgh. While lawmakers don't have the same platform, they often use their spare tickets to make their own political points. For Democrats this year, guests will include Americans affected by immigration, the government shutdown, gun violence and the president's tariffs, among other issues — a bid to send a message without saying a word.